Israel Finkelstein is the founding father of the Tel Aviv School, a group of Israeli archeologists who are skeptical about sizable chunks of the Biblical story of early Jerusalem. He is the co-author of The Bible Unearthed: Archaeology's New Vision of Ancient Israel and the Origin of Its Sacred Texts , perhaps the single most important popular book for those who'd like to minimalize the Jewish history in Jerusalem - though I rather suspect most people who cite it have never read it, and most of those who have read it don't understand its context. They find joy in the perceived ambiance, and examine no further. A demonstration of the degree to which Finkelstein isn't the bogeyman many of his supporters think he is can be found an an interesting article he has just published in The Forward, which appears under a mid-20th century photograph of the area which demonstrates what he's talking about: It's not Silwan, it is an archeological site of unique significance, and even if he, Finkelstein, doubts the stories about David and Solomon, the parts about Isaiah and Hezekiah are certainly true. Furthermore, the scholarship of the archeologists digging there is impeccable (remember that Haaretz suggested otherwise earlier this week). Tahrir Square still attracts curious crowds on weekends and holidays, including families there to gaze at the last remnants of the naive and romantic two-month-old popular uprising, which also photographed wonderfully in pictures broadcast around the world. However, now the backyards behind the smiling facades are being canvassed assiduously, and the seed of the political toughness is being sown that - though I do hope I am wrong - will bring about the second, real revolution, and will wipe the smiles off many faces. Even more oddly, he blames Obama, which probably isn't fair, though I suppose one might explain Obama's rise to the same cultural malaise. Benny Morris - who doesn't read this blog, to the best of my knowledge - takes direct aim at my thesis in the previous post, and says it's all wrong. There are four fundamental dynamics to Israel's conflict with its neighbors. The Jews have a sovereign state. The Palestinians don't. The West Bank Palestinians are occupied by Israel. Significant numbers of Palestinians will never accept Jewish sovereignty and will act against it, including by violence. Significant numbers of Arabs and Muslims will never accept Jewish sovereignty and will act against it. Noticeable numbers of Westerners will never accept Jewish sovereignty and will agitate against it. One can debate each and every one of the points endlessly; indeed, once could restrict oneself to dispassionate and intelligent discussion, and still keep at it indefinitely. This would result in nuanced and finely differentiated depictions; the fundamentals would still be the same four dynamics described above. There is no way to achieve peace in our generation. No matter what agreements are signed and what changes made on the ground, there will remain significant numbers of Palestinians, Arabs, and Muslims who will continue to wield violence against Jewish sovereignty, and noticeable numbers of Westerners to support and aid them. Seen through soulless logic, the destruction of Jewish Israel would enable the peace of the graveyard. Likewise, were the implacable enemies of Jewish sovereignty to change their minds, peace would be possible. Seen in the historical perspective of centuries and millennia, either outcome might happen. Not anytime soon, though. In October 1973, according to many publications, there was a moment when some Israeli leaders feared the military actions of Egypt and Syria might destroy Israel, and they mooted the use of nuclear weapons. There has never again been a concerted military action that could destroy Israel, and there's unlikely ever to be one for as long as Israel is perceived to have a strong nuclear option. Violence against Israel since 1973 has always been an attempt to break the Jews' willpower. The growing attempts to isolate Israel and deligitimize it have the same goal, of forcing the Jews to give up their obstinate determination to have sovereignty. Compared to long periods of Jewish history, deligitimization is a reasonable problem to have. For that matter, deligitimization compounded with a low level of violence isn't an existential threat, either. Yet Jews haven't become one of history's oldest living nations by passively suffering circumstances. They have always tried to improve their lot, often with surprising success; Zionism is merely one of the more spectacular improvements. The Zionist tradition of activism requires we confront the present threat, rather than wait. The way forward is to disable the weapons of our enemies. Since the single most potent weapon in their arsenal is our occupation of the Palestinians, we must do as much as we reasonably can to end it. Ending the occupation as a maneuver in an ongoing conflict is not the same as making peace. Making peace requires that all side to the conflict accept mutually agreed terms. There's a reason this hasn't yet happened, namely that the two sides cannot agree; even if they could, however, no Palestinian government could reconcile all Palestinians, Arabs and Muslims to Jewish sovereignty, nor convince the western supporters of ongoing violence to desist from aiding and abetting it. The aim of ending the occupation is to severely weaken the enemies of Jewish sovereignty by reducing the wind which currently blows in their sails. As recently as 2006, a majority of Israel's voters felt it would be possible to end the occupation through the program Ehud Olmert called Hitkansut, which broadly meant Israel would move back to the line of the security barrier, and allow the Palestinians to do their thing beyond it. As the elections of that Spring approached, Olmert told us explicitly that was his plan, and he won the election. Since then however we have seen a number of unfortunate developments. First, the result of Israel's unilateral retreat from Southern Lebanon in 2000 proved to be war in Summer 2006. Second, the United Nation Security Council Decision 1701 - as solemn a guarantee as the international community can give - which promised Hizballah would not be re-armed, has proved totally useless. Third, the Palestinian response to Israel's evacuation of Gaza was to elect Hamas and go back to war with Israel. Fourth, the international community's implied commitment to support Israel when it disbands settlements and evacuates Palestinian territory proved worthless. Fifth - and perhaps most serious of all - the decision of the Obama Administration to renege in 2009 on public commitments made by the President of the United States and ratified by both Chambers of the House in 2004, in return for Israel's evacuation of Gaza, demonstrated that even the United States cannot be trusted. Finally, we recently learned to our horror that regime change in Egypt may well mean harm to the peace we made with that country - not its president - 30 years ago. So even internationally acclaimed treaties only have temporary value. In spite of the events of 2006-2011, the need to end the occupation or at very least significantly limit it is still there. Moreover, there are still measures Israel can make to promote this goal. 1. Stop building in settlements that will someday be dismantled or transferred to Palestinian sovereignty. I'm not drawing a line, but Israel needs to. 2. Pass a law that enables Israeli citizens of the settlements who wish to move back inside the line to do so without losing the value of their homes (significant numbers of settlers are eager to move but can't). 3. Have an election where the question of dismantling settlements is clearly on the agenda. I'm reasonably certain whichever party suggests this in an intelligent way will win, but let's have the election and see. 5. Demand of the United States and Europe that they figure out a way to assuage our fears of relinquishing military control of most of the West Bank so as to enable the emergence of a sovereign Palestinian state. This state will not be at peace with Israel, for the above reasons, nor will it have the borders the so-called moderate Palestinians insist they need. Still, let's change the dynamic. Rather than deligitimizing Israel for obstructing Palestinian independence, let's frame the discussion as a border conflict between two states. And let's put the responsibility for calm on the NATO nations. You want an independent Palestine? So do we. So you disarm it and keep it harmless. 6. Plan and apply practical policies to detach Palestinians from Israel: demand of them that they use their own currency rather than the Shekel, that they build an economy that doesn't trade 80-plus percent of its goods with Israel, and so on. 7. Promote the well-being of the Palestinians in East Jerusalem. Already today most of them prefer Israeli rule, and growing numbers of them are acquiring Israeli citizenship to replace the permanent residence status they already have. If the people of Jerusalem are Israeli citizens, it's hard to see how the land they live on can be defined as occupied. Concurrently, change the Israeli law that defines Jerusalem's municipal lines so that the 60,000 Palestinians beyond the security barrier (mostly in Kfar Akeb and Shuafat) are part of the West Bank, not Israel. Essentially, this means division of Jerusalem though not on the line the Palestinians hope for. Yet it would change the dynamic of the discussion: Israel would be able to demonstrate it's willingness even to hand over sections of Jerusalem. So far I have spoken only of Israel's needs and interests. Ending the occupation, however, would be the right thing not only because it's good for Israel. The Palestinians really don't have their own state: they should. It will admittedly not be the one they want - this is true in any scenario - but they should have a state of their own. Zionism is about correcting the existence of the Jews, not preventing Palestinian's national existence. The two nations cannot each have their entire homeland for themselves, but they should each have part. The line of division will reflect more than a century of actions taken by each side, and the Palestinians will end up with the smaller part as a result of their actions; they should however at least have that part. Alex Stein, an occasional reader of this blog, has reactivated his own blog. Alex is rather to my left, and he and I disagree on much, but he's solidly within the healthy diversity of opinion any functioning democracy must have. After I posted last week on some pernicious radical-left Israelis who support the families of murderers as they defame Israel, I had the dubious pleasure of observing some of their attempts at apologetics. The best they could come up with was that since the Machsom Watch visit to Awarta had been before the gag order on the investigation was lifted, they couldn't have known better; this in spite of the obvious fact that their visit and subsequent reports took place after the conclusion of the investigation itself, when there was widespread unofficial knowledge about its results. At least whoever was making those excuses had some sense of shame. When I contacted Didi Remez to hear his opinion, he refused to utter a single word of criticism of his friends of the radical left, preferring instead to attack me personally. The reason I occasionally pick on Didi is that while he has no impact on policy or even on the Israeli political discourse, in the parts of the world which love to hate Israel and use Israelis as their sources of malice, Didi is a significant figure. The insight I gleaned from the exercise is that Israel's radical left doesn't criticize the society it comes from as part of an attempt to make it a better place; rather the motivation draws on estrangement and revulsion. On that level, the radical left aren't capable of testifying about Israeli society at all, since they've severed their relationship with it. On a related note, here's a very funny talk by Souad Amiri, a Palestinian who uses humor to confront Israel. Of course I could point out the fallacies in her narrative, and so could most readers of this blog, but she's still funny. Enjoy. Niot Watzman, son of the co-author of the South Jerusalem Blog Haim Watzman, has been killed in an accident. He was 20. Haim recently blogged about a friend who lost a daughter and wrote a meaningful book about the loss and life thereafter. Haim has already written two books and translated many more; maybe he'll someday be able to craft one out of this horror, unimaginable as the thought must be today. "If there's one thing that even slightly consoles me", he told me this morning, "it's that Niot was a happy person. He enjoyed his life". Avi Bell elaborates on how awful the Goldstone Report always was. There was a report, but it was preceded by no investigation. Newsweek, always a superficial newspaper, now deep into intellectual decline, has a longish puff-story about Mahmoud Abbas. Somewhere along the way a representative of the Obama adminsitration denies most of what Abbas has to say, so this gives us an inkling about how serious or not the man may be if it's a permanent and solid agreement you wish to build on him. At one point in the Abbas story, he says the Americans deciding what to do about the Egyptian revolution could have chosen between chaos and the Muslim Brotherhood, and got them both. Gideon Rachman reports in the Financial Times that Abbas may be right. It doesn't sound good, though at this stage we should still hope for the best since we can't do much else anyway. Michael Oren writes about Israel's value to the United States. His article builds on things he knows as a scholar, from the days before he was a diplomat. Imagine a sewage tunnel built more than 2,100 years ago, which could still be used almost a century later by rebels attempting to escape a besieged city, but being fished out one by one and killed. Imagine a contemporary book which describes this all, which is still a popular read 2,000 years later. Imagine that the city above continues its life, repeatedly being built, destroyed, built and destroyed, while no-one ever returns to the long-forgotten sewage tunnel, which is assumed to have been a legend or an exaggeration or the figment of someone's fervid imagination. Now imagine a team of professional archeologists who accidentally stumble into the ancient tunnel, then spend a few years carefully cleaning it out, thus demonstrating that it's still there, in its entirety, and is large enough to walk through from end to end. Soon, they announce, perhaps even as soon as May 2011, it will be open to the public, and everyone will be able to walk though it. In any normal place in the world, this would be a wonderful story, it would be favorably reported in the world's media, and would be celebrated at least as a minor wonder of the world. Alas, there's a snag to the story. The archeologists are descendants of the original builders and their grandchildren the rebels. They speak the same language, and regard the ancient city as their capital, just as their forefathers did. Uh oh. Not good. Bad, as a matter of fact. Very bad. Pernicious. Destructive. Horrendous. Haaretz has a long report on the matter, which explains why opening Herod's sewage tunnel is a Zionist conspiracy designed to undermine Palestinian homes and destroy truth, or something of the sort. Thankfully, Nir Hasson, the author, also reports on the counter arguments, so it's a balanced report and you can judge for yourself. Balanced, that is, in the crazy reality which regards Jews unearthing Jewish history as a colonial conspiracy. I've been through the southern half of the tunnel, by the way. Once it's opened it will be an ideal place to tour on hot summer days, which Jerusalem has many of. Sharon decided to act without an agreement with the Palestinians: “I will take these new steps as unilateral steps; I don’t want to be in their hands,” he told me at the time. The theory was simple: If there is no real negotiating partner, try to shape Israel’s future yourself. Don’t wait, and don’t limit yourself to what the Palestinians will agree to right now. But Sharon asked Bush for what he called “ideological compensation” to make up for the lack of actual compensation from the Palestinians for his moves. There would be no peace treaty, no Palestinian concessions, no abandonment of claims by the PLO; instead there was Bush’s endorsement of several critical Israeli positions in his April 14, 2004, letter to Sharon. There Bush addressed both the refugee and settlement issues. He stated that Palestinian refugees had no “right of return” to Israel and would have to find a future and a solution in the eventual state of Palestine, and he argued that a return to the 1949 armistice lines—a term he used in preference to “1967 borders”—was unrealistic given the existence of the major settlement blocks. To Sharon these statements by the president of the United States were critical gains for Israel, and they were soon endorsed by resolutions in both houses of Congress. But those statements have been forgotten and abandoned by the United States, treated by the Obama administration as if they were some kind of private gesture by Bush in a personal note to Sharon. This devaluation of solemn pledges among allies has been a huge Obama mistake, for it undermines the value not only of past American pledges but of his own future words as well and makes Israel far less likely to take risks for peace. But Israel should not be frozen in fear of a Palestinian declaration of independence or recognition at the U.N. and should in fact head it off. Perhaps the next country to recognize an independent Palestine should be Israel. Israel should say that with this new state of Palestine it has a million practical issues to discuss, beginning with grave border disputes but continuing from customs issues to the management of the Allenby Bridge to possible use of Mediterranean ports. Personal status issues are dangerous and complex: What is the situation of Israelis in areas the state of Palestine views as its own? Is it the Palestinian position that the new state must be Judenrein, a position President Abbas has repeatedly taken? Israel should immediately challenge that position in every possible forum, for it is an indefensible racist view that the EU for one will have to denounce. Israel should demand immediate negotiations on all these complex matters, and remind the world that the dozens of statements “recognizing a Palestinian state” actually do nothing to advance the parties toward the resolution of the issues they face. In fact, commencement of practical negotiations on some of these issues between Israel and “Palestine” might lessen their appeal as great causes and turn them from emotional claims into tedious and detailed bargaining positions. Israel should start to disentangle itself from governing the West Bank and the Arabs who live in it, and if this cannot be achieved through negotiations with the Palestinians it should be achieved through Israeli-designed unilateral steps that maximize Israeli security interests. One example: passage in the Knesset of a compensation law buying the home of any settler who wishes voluntarily to move back behind the security fence, whether to Green Line Israel or a major settlement. Another: turning additional areas within the West Bank over to the PA for normal daily governance. Such moves, which signal an intention to change the ultimate pattern of Israeli settlement in the West Bank, do not require abandoning the IDF’s security role there. Nor do they require or accept a total settlement freeze, which would be counterproductive: Whatever the wisdom of a freeze in outlying settlements that will eventually become part of Palestine, to freeze construction in the major blocs that will remain parts of Israel is to send exactly the wrong message. Israeli officials should explain the policy to the Obama administration and the Europeans (among whom some consequential leaders, like German chancellor Angela Merkel, are still friendly to Israel): It looks like final status negotiations are not on, and anyway they may take forever or may fail. So Israel will act, trying to shape a better future for itself without harming the Palestinians. We won’t wait for them, but nothing we are doing closes off possibilities for future agreements. In fact, reaching those agreements will become easier over time, not harder, if Israel begins to act now. Israel should use as its set of principles the Bush letter of April 14, 2004, in essence demanding that the United States adhere to pledges made about the key issues. No “right of return” for Palestinian “refugees” except to the new state of Palestine; secure and defensible borders for Israel; no full return to the 1949 lines, given the new realities on the ground; final borders to be mutually agreed; Israel as a Jewish democratic state. But Netanyahu will have to act as well as speak, telling both Israelis and foreigners what he will do to begin to shape an outcome where there are no Israelis in over 90 percent of the West Bank. He can maximize the ability of Israel’s friends and supporters, not least in this country, to support Israel if he acts with boldness and principle to guarantee the future safety of the Jewish state. Read the whole thing. He's right. The four Jewish hospitals. The University (all three campuses). The center of town. The Mamilah open-air mall. The Malcha air-conditioned mall. The public swimming pools. The Hadassah Technological College. Cafes on Emek Refaim. The Knesset. Machane Yehuda. The markets of the Old City. Abu Shukri in the Old City. The city parks. City Hall. The courts. The National library. Most supermarkets. Buses. Taxicabs. Security guards: you'd be astonished how many of them seem to be Arab. The Police. The water company. The Firefighters. Construction sites. Which reminds me that last week we overheard a lady at the cinemateque, probably a visitor from Tel Aviv, saying to her friend "this little Jewel is the first place we've seen since entering the city where there are no Haredi. Such a relief!" Having recently read Simon Sebag Montefiore's Jerusalem: The Biography , then a book in Hebrew on the Jerusalem municipality under the British, and now I"m approaching completion of Karen Armstong's Jerusalem: One City, Three Faiths , I feel reasonably confident in saying there has never been a period in the past two thousand years when all of Jerusalem's inhabitant's enjoyed freedom and equality - unless it was in the periods when entire religious or ethnic groups were simply banned, so the remaining insiders enjoyed equality among themselves. This morning, being Easter Sunday, I walked through the Christian Quarter of the Old City. Masses of Christians from the world over were celebrating. The Arab Christian shop owners had mostly not opened their establishments so their Muslim neighbors were doing a roaring business. The Jews are celebrating the week of Pessach, so there were lots of them around - Israeli tourists or international ones. It wouldn't be accurate to say there's perfect peace and equality in Jerusalem at the moment, but the situation is closer than it has ever been. For years I've believed - and have said in print - that for all my disagreements with far-left Israelis, they were a legitimate voice and deserved respect for criticizing from inside the war zone: if proven wrong, they'd be here to pay the price; when Palestinian or Hisballah murderers do their best to kill random Israeli Jews, the far-left Israelis are here along with all the rest of us. This creates a qualitative distinction between them and their foreign fellows in malice. I'm no longer convinced. As I've long been documenting in this blog, the contribution Israel's radicals make to the Big Lie against Israel is immense; sometimes the entire anti-Israeli argumentation comes from them. Absent them and the hatred of the Jewish State wouldn't go away, but its purveyors could present far fewer arguments. This week we've had a further example which to my mind crosses all the lines of simple human decency. The Hebrew part of the Internet has been all a-buzz about the story of the Israeli radicals who went to the West Bank town of Awarta to give succor to the families of the murderers of the Fogel family, while disseminating unforgivable slander against the IDF and the law enforcement agencies. The story of the investigation was under a gag order for a month, until its successful conclusion. Still, Israel being the very small place it is, anybody who cared to know had a pretty good idea what was going on. In brief, immediately after the murder trackers identified tracks of the suspected murderers from Itamar to the nearby town of Awarta. We now know that the two suspected murderers walked back home after the massacre of the Fogel family, where a number of their friends and relatives burned their clothes and hid their weapons near Ramallah. The investigators, who had reason to believe the murderers and potential accomplices were in town, but couldn't yet have known who, how many, how well armed, and if they intended to murder again, sealed off the town and began to investigate. At a minimum, the investigators knew the murderers had the two M-16's stolen from Itamar. At one point they collected DNA samples from most of the men. Had anyone come forward and admitted their part in the massacre the investigation would have been greatly expedited, but this didn't happen, so the investigators had to find their men in a hostile environment. They succeeded in less than a month. The week before the gag order was lifted the suspected murderers were brought to Itamar to re-enact the murder, so everyone in Itamar knew they'd been caught; soon, everyone else who cared knew, too, even if the precise identities of the murderers were not yet known. At this point a delegation of radical Israeli leftists visited the town: after the investigation, mind you, since as they openly said in their subsequent reports, during the investigation itself they couldn't get in. The horror that we saw with our own eyes in the home of Mahmoud Awad cannot be described as anything but a pogrom, primate and brutal vengeance intended solely to impose fear in the heart of the residents. All rooms in the home were turned upside down. Most of the furniture and electronic equipment was broken. Food from the kitchen was dumped on the floor and on it a large vat of oil was poured. The mother of the family, Shama and the children Majd, 14 years old and Alaa, 6 years old, who were not detained, related that the army’s invasion of their home began at 4am and ended around 11am. Family members were dragged out of their beds and not permitted to bring warm clothing or blankets. A soldier who saw the little girl trying to shield herself from the cold ripped the blanket away from her. Alaa relates that “they took my blanket and I was very cold and afraid, and waited outside until the soldiers left. Majd notes that “I was handcuffed, my eyes were covered and they beat me. All in all I’m a little boy, what did I do wrong? The father of the family, Mahmoud, 45 years old, the son Majdi, aged 20, a third year university student and the son Amjad, 19 years old, a first year university student and the son Hakhem, 17 years old, were detained. Their cousin Ayman, 21 years old, was also detained. The mother claims that soldiers took 2,500 Jordanian dinars from a drawer and 5 mobile phones. The mother looked broken, in shock and in deep grief. The fear and terror had not yet left her eyes. It gets worse. Hagit Beck, a member of Machsom Watch, describes on her blog how she and some other women went to visit "the 2 homes which had been ransacked". The second of the two was the home of Hakem Awad. (Isn't in interesting how in spite of all the horror, the reports all seem to focus on the same one or two homes?). The blog-post has been put up also on the Machsom Watch website: they're obviously proud of it. While in the house, Raya Yaron, the Machsom Watch spokeswoman, tried to comfort Shama Awad, mother of suspected murderer Hakem Awad, and wife of one of the men suspected for destroying the evidence. If proven in court, this will mean Shama Awad hid her murderer son from the police for most of a month, knowing fully what he had done. This is the woman Raya Yaron is embracing, and Hagit Beck is celebrating. For what it's worth: The Alternative Information Center is cited on page 555 of the Goldstone Report as one of their sources. Also, some of the Hebrew websites are claiming that the two NGOs are or have been supported bythe NIF. It's plausible,but I haven't checked. Something worth looking into. Asael Street is on the Green Line in Abu Tur, on the hill south of the Old City. It's a small street, which can be entered by car only from the south, where the skeleton of a 1948-67 IDF bunker still stands, a reminder of the 19 years in which the neighborhood was divided between Israeli territory in the West, and Jordanian territory in the East; in those days the line between the homes was hostile and sometimes violent. The years of peace and prosperity since 1967 have encouraged the locals to build right up to their respective national lines, and the result is that along the entire line in Abu Tor, Jewish and Palestinian homes sit next to each other. In the picture below, the red-roofed building is Palestinian, and the building facing it to the left is Jewish. They're both on Asael. Here you can see how narrow the street is; in this picture the red-roofed building is on the left. Since there are cars parked on one side of the street, the truck had to inch by them, so narrow is the street. If the city is ever divided, there will need to be two different trucks, each serving its respective side. No, don't tell me the services will remain unified, since they won't: One of the most essential aspects of sovereignty is that society determines its own priorities. That means one side may decide to buy new garbage trucks every eight years, while the other allocates funds for garbage trucks only once in 20, because it has other priorities. On one side garbage workers are paid at Israeli wage levels and come by every two days; on the other side they may be paid only a quarter, or a fifth, and come by only once every three days. Or vice versa, what do I know: maybe it will be the Palestinian ones who come by every day, and do a great job, while the Israelis will only come by once a week, and in the meantime the Jewish neighbors will throw their garbage onto the Palestinian side. Since there isn't a single such place anywhere in the world, it's hard to know what the specific grudges will be and how they'll poison the atmosphere on this peaceful little alley - but they probably will. At the end of the street it turns west, so that the final homes on both sides are all Jewish. The building on the right is Palestinian; the one on the left is Jewish. And the picture below shows the intended border. Have I mentioned I find this whole proposition to be extremely idiotic? Having finished looking south of the Old City, I went to its north, and described the sights there. I assure you, there are new aspects to the story there, new degrees of oddness. The largest contingent came from China, which has an extensive record of dealings with Iran and indifference to sanctions. So does U.S. ally Germany, and more than 40 German companies were in Tehran this week. Austrian companies were also well-represented, and the Spanish government sent an official delegation. Also present were India's Essar Group and Norway's Statoil, two firms that previously announced they were cutting ties with Iran—and thereby earned recognition from U.S. officials as examples of successful international pressure. So much for that. Charles Blattberg responded to my post about how international law has not created world peace or anything remotely like it, by e-mailing a link to an article he wrote attempting to explain why this is so. The abstract is here, you can download the entire article at a link in the upper left corner. I admit it's too philosophical for my abilities, though it seems he's writing about a tension which the Talmud resolved some 1800 years ago with the simple statement: "The poor of your town and the poor of another town, the poor of your town come first". This probably also means the Talmud disagrees with The Guardian, but there's not much novelty in that thought. The New York Times tries to figure out what made him change his mind. (If you've run out of free access to the New York Times for the month, Haaretz summarizes the article here). The thesis seems to be that he thought that by castigating both sides, he'd promote a process of mutual reflection and eventual reconciliation; this bizarre idea stemming from a similar experience he had in South Africa as Apartheid waned. Yet another example of how different Apartheid always was from the Israeli-Palestinian conflict. Mostly, however, it's a demonstration of how weirdly ignorant Goldstone may have been (and still is) about the conflict here. He noted in Sacramento, for example, as in his later essay, that the deaths of about 29 members of one Gazan family grouped together by Israeli soldiers in a building that was subsequently bombed probably resulted from a misreading of a drone photograph. Men carrying firewood might have looked as if they were holding rocket launchers.At a debate last month at Stanford Law School, he did not excuse that Israeli killing but said that originally, “in the absence of any evidence at all, the only conclusion we could come to was that it was intentional.” Now it appeared to have been negligence due to lack of communication and verification, he said. [My emphasis]. Translation to English: we didn't know what we were talking about, since we lacked most of the relevant data, so we had no choice but to assume the worst about Israel and broadcast this assumption to the world as proven fact. Only after the enemies of the Jews greeted this malicious accusation with the greatest of glee did it occur to the judge that he had been willingly manipulated. In my understanding of repentance, he hasn't even started the process. What he needs to do now is systematically tear down the entire edifice he built; if it take the rest of his life, so be it. Why Oh Why Don't the Downtrodden Israelis Revolt? Yuval Elbashan, a 40-something Israeli lawyer who'd like to rectify all the social woes of Israel (wouldn't we all?) moans about how the downtrodden masses are so downtrodden they can't muster the energy to revolt. Of course, one might argue that the downtrodden might be better advised to invest their energies in actively bettering their situation and generally getting on with their lives. One might ask if that hasn't been the broad trajectory of most Israelis over the past six decades since most of them arrived mostly penniless and were stuffed into refugee camps by very harried officials, until the present day when most of them (not all, alas) live reasonable lives in a wealthy society. One might ponder whether theorizing about the dearth of revolution is actually as useful as pursuing capitalist occupations such as making money and spending it. But then one wouldn't get published in Haaretz. On the contrary. One might well get sneered at by Haaretz. Israeli industrial exports in the December 2010 to February 2011 period jumped 23% - in annual terms - mostly as a result of a steep rise in high-tech exports, 28.1%, the stats bureau reported. The increase in exports came despite exporters' complaints in recent months over the fall in the dollar against the shekel, reflecting the recovery of Western economies. This is the sort of thing Jon at Divest This! likes to write about: the more the boycotters strive, the faster Israel's economy grows. I rather doubt there's any correlation, but the growth is welcome and important; keep in mind Yaacov's Three Parameters for measuring Israel's strength, the third of which is economic. The first is that people are living longer, but they are retiring earlier than they were 40 years ago. A higher proportion of their lives is thus spent in retirement. Second, the large generation of baby-boomers (in America, those born between 1946 and 1964) is now retiring. But the following generations are smaller, leaving the children of the boomers with a huge cost burden. Third, some employees have been promised pensions linked to their salaries, known as defined-benefit (DB) schemes. In the 1980s and 1990s the true cost of these promises was hidden by a long bull market in equities. But the past dismal decade for stockmarkets depleted those funds and left employers on the hook for the shortfall. Private-sector employers have largely stopped making such promises to new employees; the public sector is beginning to face the same issues, particularly in Britain and America. Fourth, private-sector employers are now providing pensions in which the payouts are linked to the investment performance of the funds concerned. These defined-contribution (DC) schemes transfer nearly all the risk to the employees. In theory, they can provide an adequate retirement income as long as enough money is paid in, but employees and employers are contributing too little. Both sorts of funded schemes, DB and DC, essentially face the same problem. “The aggregate amount of pension savings is inadequate,” says Roger Urwin. The situation is Israel is different. There is no baby-boom generation which hangs over its predecessors and descendants. There have been ups and downs in rates of fertility, but at no point have the rates ever been negative. Looking forward, each retiring generation will be followed by a larger one. In spite of this, Israel already has raised the age of retirement to 67, higher than almost anywhere else (though a few far-seeing countries have recently moved to peg the retirement age to longevity; given Israel's high life expectancy, we'll probably have to do the same). Most Israeli workers are paid from pension funds, not the government budget, and in DC schemes; since these are mandatory by law, most people contribute to them automatically their entire post-student working lives. The pensions are computed as a rough average of contributions throughout one's career, so there's no way to artificially raise decades worth of pension by tweaking the final year or two of a career, as is often done elsewhere. How is it that Israel seems to have mostly sidestepped a strategic predicament that looms over most developed nations? I don't know. Perhaps we've had some reasonable decision-makers along the way. Netanyahu raised the pension age in 2002 when he was Finance Minster; other parts of the configuration were in place earlier. The current attorney general would do well to remember the damage done during the Iraq affair, when dubious interpretations of resolution 1441 were used to license the course the superpower was already set on. This created the sense that the UN's role was a fraud. Whether it has been right or wrong on Libya, it has proved capable of shared resolve, and shown it can have teeth. The new language of regime change may leave the council descending into accusations of bad faith – and the planet slipping back into a more lawless world. [my emphasis]. If I understand the argument, it seems to be saying that the rise of the UN and international law have made the world a more lawful, and thus more peaceful, place. I suppose this might seem compelling to an egotistical ignoramus in Europe, but does it bear any relation to the human condition? I didn't think so, and did a spot of digging around - well, about 30 seconds of digging, to be precise. Google directed me to this list of the wars of the 20th century, which seems to be hinting that there were more than twice as many wars worldwide in the half century since the foundation of the United Nations as in the half century preceding its creation. This seems to indicate that abolishing the United Nations and discarding international law might dramatically reduce human suffering. At any rate, that's the plausible outcome if you concur with the Guardian that there's any connection whatsoever between the UN and international law on the one hand, and the human propensity to warfare on the other. It is common knowledge the world over that Israel continues to enlarge its settlements in the West Bank, devouring ever more of the territory the Palestinians regard as their own. Israel is condemned for this every day of the year. Since the advent of President Obama, it has also been in a state of high tension with its only significant friend, over its insistence on not freezing construction. The only problem with this narrative is that it's not true. Anyone who wanders around the West Bank (admittedly a very very very small subset of the people with an opinion on the matter) knows perfectly well that the settlements aren't growing, and haven't been growing much for at least the past 5-6 years, not to mention the mildly relevant fact that there aren't any new ones being built at all. Sadly, this is true also in Jerusalem, where Netanyahu's rhetoric has been quite decisive: Jerusalem is our capital and we'll build in it as needed. Now the minister of Housing and Construction admits as much openly. There are no large construction projects happening in East Jerusalem (and precious few small ones, either). Yiddish has a pithy saying for such a situation, but this isn't a Yiddish blog. Judaism is famously both a religion and a nationality, though this is not a matter everyone likes to accept. Recently I've been revisiting various topics and seeing them through the prism of the knowledge I've accumulated over the years, and I'm beginning to suspect the case for Jews being a nation is even stronger than Jews as a religious belief; at the very least, the beliefs have repeatedly and dramatically evolved over the ages. Given Judaism's unusual longevity, there's been a lot of time for evolution. Of course this isn't a particularly startling insight. The entire Koran reflects divine words handed down in the single lifetime of Mohamed. The New Testament covers, what, two centuries? The Hebrew Bible (aka Old Testament) spans at least 1,500 years, if you start counting with Abraham. Most of what was recognizably Jewish on the eve of the Emancipation, in the 18th century, was created or added after the completion of the Bible. So it's banal to say that Judaism contains very thick layers of historical memory. King David and his contemporaries, whatever their culture was, didn't much resemble the earliest creators of the Mishna, who were roughly contemporaries of Jesus, and while we can trace the line from them to the Lubavitcher Rebbe and to his contemporary Abraham Joshua Heschel, it's unlikely the Tanaim would have foreseen either scholar. This also works backwards. The Holocaust plays a central role in the identity of America's Jews, yet it obviously didn't play any role in the identity of their great grandparents who migrated at the turn of the 20th century. The destruction of the (2nd) Temple and the yearning for Jerusalem were absolutely central to the identity of Jews for some 2000 years, but no-one had ever heard of them when the Hasmoneans. What did Judaism in Jerusalem in Isaiah's time look like, in the 8th century BCE? There's no real way of knowing, but even if it was as memory based as Judaism has become, it was laden by perhaps 8 centuries of it, not 35. (I'm not discussing modern theories of ancient history here, nor am I discounting them. That's not the topic, and doesn't change my point). Predictably, but perhaps not fully appreciated, the Jews have long been aware of this dynamic. Nothing better demonstrates this than the story of Moses' visit to the yeshiva of Rabbi Akiva, as told on a daf we passed last week. - Creator of the World, who's delaying You [who needs the ktarim]? - There will one day be a man, after some generations [about 1,400 years, to be precise], named Akiva son of Josef, and he will learn many halachot from each thorn and thorn [katrim look a bit like thorns]. - Creator of the World, can you show him to me? - Walk back behind you. Moses found himself in the yeshiva, and sat at the back of the room behind all the scholars. He didn't understand anything that was being discussed no matter how hard he tried, until at one point the disiples said to Rabbi Akiva "Rabbi, how do you know that?" "It was given to Moses at Sinai". Reassured, Moses returned to God. - Creator of the World, You have such a man in your world, and you've chosen me to bring down the Torah? - Silence. That is my intention. - Creator of the World, You've shown me his greatness in Torah, can you show me his reward? Moses found himself at Rabbi Akiva's execution, as the Romans were slowly torturing him to death. - Creator of the World, that's Torah and that's it's reward (zo Torah ve-zo sechara)? Menachot 29b. This thread is introduced and explained here. An oft-cited mantra tells that whenever Western countries fight Muslims, they inevitably create additional terrorists. In some circles this idea has acquired the status of an article of faith, perhaps even a fundamental dogma. In reality it probably is true in some cases, and false in others. Some people who are filled with hate may be propelled by this or that into violence; others, with different frames of mind, will be deterred by violence. I'm not aware of any solid research which has ever investigated the balance, and to be honest, I'm not certain how such an empiric investigation might be carried out. Which leaves us with our beliefs: some of us belive one way, others the opposite. While many view Hamas as a radical Islamist group, the responsibility of being in power has forced it to sacrifice ideology for a pragmatism that has alienated many of its supporters. Some have rejected Hamas's brand of nationalist Islam and embraced fundamentalist Salafi Islam, which aims to create a single Islamic commonwealth in place of nation states. Tawheed and Jihad means oneness of God and holy war or struggle. The Army of Islam split from the Popular Resistance Committee. It initially carried out operations with Hamas such as the kidnapping of Israeli soldier Gilad Shalit in 2006. When relations between it and Hamas broke down, the Army began kidnapping foreigners, including two people from Fox TV in 2006 and the BBC's Alan Johnston in 2007. Johnston was released unharmed after four months. To be clear: even according to the Guardian, when radical Palestinian groups begin to accept the reality of Israel's existence, even if only on a very limited basis such as Hamas in Gaza, this inevitably further radicalizes some Palestinians. Put concisely: making peace with Israel will create terrorists. This dynamic is not new, and not surprising. Nor should it preclude Israeli attempts to reach accommodation with the Palestinians. It does however mean that even when the accommodation is eventually reached, Israel will need clear borders with the Palestinians, and it will need to control the gates through those borders, so that the murderous Palestinian crazies won't be able to get in along with the peaceful ones. It will not be possible to have an open border running through Jerusalem, of course. It won't. Any division of Jerusalem will inevitably mean a hard border running right through the city. Don't believe anyone who tells you otherwise, no matter how impeccable their credentials. Germany is Iran's main European trade partner. Austrian imports from Iran rose by 397% in 2010. I'll be traveling to Germany to give some lectures next month. I suppose I should add this item to the agenda. How Many Palestinian Refugees Were There? Jewish Ideas Daily recommends we read Efriam Karsh on this question. On the scale of American friends of Israel, Aaron David Miller is not anywhere near the top of the list. All the more interesting, therefore, that he's very critical of the Palestinian intention (if it really is an intention) to collect a UN declaration of Palestinians statehood. A very dumb idea, says Miller. Vittorio Arrigoni, an Italian ISM volunteer in Gaza, has been murdered by local Islamists. The Israeli Y-net website has an interview with him, in which he explains that his arrival in Gaza in 2008 was the happiest day of his life, because he and his friends had broken a the blockade which began in 1967. (Their boat was allowed through by Israel). He goes on to explain that he's here because it's in his DNA: his grandfather fought the Italian Facists. The interview is only a few minutes long but has enough nonsense in it to fill a very long blog-post. Rachel Corrie was accidentally killed by the IDF in 2001, yet her name has been widely commemorated, there's a play based on her letters, and she has become an icon of the non-Arab anti-Israeli forces. Arrigoni was purposefully abducted, beaten and hanged, so he should rightfully be canonized even more. I doubt this will happen, but who knows. We'll wait and see. On another related matter: Salafi murderers are a small minority among Palestinians. But they're there, and if you assume the Palestinians are Arabs or Muslims, their power and popularity could yet grow, as has happened elsewhere in the Arab and Muslim worlds. Salafists hate all sorts of people, including Italian fools who hate Israel, but they vehemently hate Jews. I think any reasonable person would agree that offering such murderers uncontrolled access to large numbers of Israeli Jews would be a bad idea. Yet that precisely is what most of the world, from President Obama down, insists is the key to peace, since Jerusalem must be divided and also remain an open city. I apologize for droning on about this matter, but I admit I'm personally threatened by the imbecilic idea. Update: Just Journalism demonstrates the British media are being worse on this story than I'd said. David Ignatius is an important journalist who's been around a long time and is regarded as reliable. He's been talking to prominent Egyptians, and has a column about three he thinks will come out on or near the top. Amr Moussa and Mohammed el-Baradei are no-brainers if you're an external observer who couldn't name five Egyptians without a spot of Googling. (And I have no idea if the Egyptian voters will agree that they're so important, or if this is a Western conceit). It's interesting to note that the three men seem significantly more wary of the Muslim Brotherhood than most of the Western media is. The reason I'm interrupting my non-blogging to call attention to the Ignatius column, however, has to do with Naquib Sawiris, the third Egyptian power-broker he chooses to introduce to us. Is there any conceivable way Ignatius can know that Sawiris' new political party is powerful? There isn't is there? Normally, the power of political parties is measured first and foremost by results of elections, and that hasn't happened yet in Egypt. I suppose one might try to gauge such power by counting membership or some other form of secondary measurement, perhaps the power of political patronage - but Sawiris' party didn't exist a month ago, so that can't be it. Note also that we're not told what the name of the party is, which may somewhat hamper our ability to watch it as it rises or not. Can the New York Times Count till Ten? If you read this correspondence between Isable Kershner (NYT) and Lenny Ben David, the answer seems to be: No, the NYT isn't good at counting up to ten. I'm offline most of the time these days, hence no blogging. Still, things can happen even in the real world out there. The other day, for example, I heard a short presentation from a fellow who's involved in the very large project of building a new train line up to Jerusalem. Much of it will be underground; occasionally it will cross high above valleys; travel time from Tel Aviv to Jerusalem, once it's completed, will be about half an hour, and the final station will be deep underneath Jerusalem.The whole thing will be quite dramatic. The fellow started his presentation by showing a black and white postcard. (Note to readers born after 1980: Postcards were smallish pieces of cardboard with a picture on one side and a couple of square inches on the other side on which folks used to write a short message and then send through the mail. Real mail. Oh, forget it). The message said that the sender had just arrived in Paris, and was planning to take the train to Frankfurt, which he would reach at 10:37am. "The writer was my grandfather, it was 1959, and although he's no longer alive, I have no doubt he indeed reached Frankfurt at 10:37 the next morning. Half a century later, here I am beavering away on this project, and I have no idea what year it will be when the train finally reaches Jerusalem". Don't get cross with me, but this story seems to me less than iron-clad. I spent a large chunk of the day with a very old friend - we went to school together when Richard Nixon was president - who grew up to be an important fellow in the field of nature preservation in Israel. He used to be an official of the Nature Preservation Society, before moving, some years back, to the Nature and Parks Authority. As I've hinted more than once, I'm trying to figure out what's the contemporary story of Jerusalem, and this fellow has a very interesting perch from which to see things. As you'd expect, the stories he tells don't fit any of the narratives you read about in the media, but it would be surprising if they did, and anyway, that's not the point of this post. We hiked along the Sorek valley to the west and northwest of Jerusalem. This is an area which contains everything from archeological remains from most of the past 40 centuries or so, tons of infrastructure of all types and forms, a whole series of gigantic projects such as new roads, train tunnels and bridges and others undertakings, agriculture, tourism, and oodles of politics. Ah, and a nature reserve. My friend talked at length about the intricate and delicate process of making sure everybody can do their thing, without anyone trodding unduly on the needs of anyone else. (For example, the highway will sidestep a crusader ranch, even though this will entail hanging it off the edge of the hill). It was an opportunity to peer into the bowels of decision-making in a democratic system. Late in the afternoon he then made an enlightening comment. "The fine people in the Nature Preservation Society, being an NGO, can say whatever they want, and can stake purist positions. If anyone asks them how to resolve the problems they raise, they don't need to answer. They can respond that their job is to protect nature, period. How the train will cross the valley is not their business, so long as it doesn't cut across the nature. We in the Nature and Parks Authority, however, can't talk that way. We're part of the government. The part that needs to preserve nature, of course, but since we're part of the government we've got to be part of the solution, not of the external criticism. We've got to participate in the process of balancing diverse needs, multiple interests, conflicting political limitations, and so on". He was talking about preserving nature, of course, not human rights or similar NGOs,but you see how the comment readily fits into other fields of discourse and execution, too. Sometimes a picture really is better than 100,000 words. Especially when it's a typical picture, which cannot be put into any context except the most simple one in the picture, and the rest of the 99,989 words are intended to obfuscate, distort, lie and malign. Blogging is likely to be a bit slow here for the next few days. Too many other things going on. You can always read Haaretz to keep your spirits up. I"m dedicating this column to The Guardian, Andrew Sullivan, Mondoweiss, and Didi Remez and his handful of like-minded Israeli loonies. Ah, and also To Alberto, the Argentine lefty with no Arab blood but at least one Jewish grandparent who likes to call himself Ibrahim and sometimes visits this blog. The murder of a peace hero by Palestinians has no place on the left's emotional and ideological map. The murder of a freedom hero by Palestinians is a dogma-undermining, paradigm-subverting event for the left. Mer-Khamis' murder by Palestinians is a murder doomed for repression. This is a deep, broad issue that goes beyond just the Israeli left. One of the outstanding characteristics of Western enlightenment in the 21st century is its inability to denounce forces of evil in the Arab-Muslim world. Western enlightenment likes to criticize the West. It especially likes to criticize the West's allies in the East. But when it runs into evil originating in the East, it falls silent. I'm still trying to figure out what a September 2011 UN-Supported declaration of Palestinian independence would mean, and will write about this sometime soon. In the meantime, here's Yoel Meltzer's scenario. I don't find it convincing, but it's worth the read. There is only one way an anti-tank missile can hit a bright yellow school bus about a mile away: the shooter must take aim directly at it. This might not be the case on a crowded battlefield with multiple potential targets and the extreme tension of being shot at by the other side. But since that's not what happened near Gaza this afternoon, the only possible explanation is that a Palestinian gunman purposefully shot a tank-destroying missile at a school bus. The fact that the bus was mostly empty was a coincidence the gunman couldn't have known; it wasn't almost empty a few minutes earlier. The Davidsohn Center is a tourist center to the immediate south of the Temple Mount. It was opened a few years ago, and there's a funny story about that. As the American State Department refuses to learn, building in Jerusalem is an arduous and multi-stage project, which takes years to cross. The folks behind the center didn't want to wait all those years and deal with all the bureaucracy, so they made the case that they weren't actually bulding anything new, merely refurbishing the basement of an Umayyad palace. The palace was built in the 8th century and then forgotten from history until it was rediscovered in the 1970s by Israeli archeologists, who uncovered a series of monumental Arab structures no-one had known were there. Refurbishing is a shorter process than building, and so the center opened at least five years earlier than otherwise. The Haredi guide we were with said - tongue in cheek - that when the time comes to build the Third Temple the same argumentation should be made: it's a reconstruction, not a new building. Anyway, the reason the center is a tourist attraction is that it sits on the main road from the oldest parts of Jerusalem into the Temple, and throughout the two temple eras, all the way up to the destruction of the 2nd Temple in 70 CE, this was the main thoroughfare for pilgrims (the Talmud mentions this in detail, which is the kind of thing you learn when you've got a haredi guide). In the center there's a 10-minute film, in which a fellow acts the part of a modern researcher and also a 2nd-Temple pilgrim, wandering through the area then and now. It's a cute sort of thing. Since the majority of tourists to Jerusalem are not Jews, the film depicts a Jewish pilgrim from the early 1st century CE, a youngish man with a beard, who just so happens to come from the Galilee, and not, say, from anywhere else Jewish pilgrims would have come from. In case any of us weren't getting the hint, our Haredi guide spelled it out for us. The actor, depicting a contemporary Israeli and a Jesus-era Jew, is one Juliano Mer-Chamis, an Israeli mix-up who had a Jewish mother, a Palestinian father, founded and ran a theatre in Jenin, and lived on a hill above Jenin from which he could see Haifa, where he was born, and Jenin, where he made his life. He was murdered earlier this week by some Palestinian thug who apparently was angry, among other things, at Mer-Chamis' eagerness to have Israeli and Palestinian theatre troupes collaborate. Independent Palestine in September 2011: Does it Make Any Difference? The New York Times seems to think it does, and that the possibility of a UN recognition of an independent Palestine in September this year will dramatically change the dynamics of the conflict. As anyone who frequents this blog knows, the fact that the NYT is convinced of anything doesn't much impress me, as doesn't the fact that they've dug up various Israelis to bolster their thesis. So far I haven't much written about this matter, since I'm still trying to figure out what it means, but if anyone wishes to pitch in with informed insights, be my guest. Review of Michael Totten's "The Road to Fatima Gate"
It's April 5th, and Michael Totten's The Road to Fatima Gate: The Beirut Spring, the Rise of Hezbollah, and the Iranian War Against Israel is hitting the bookstores. Since Michael and I are friends, I managed to read the book before it was published, and warmly recommend it. The book is the story of Lebanon between the Beirut Spring of 2005 and the aftermath of Hizballah's takeover of Beirut in 2008. Michael tells it with his unique voice and perspective, which have already made his blog into one of the best on the blogosphere. First and foremost, he travels to the places he writes about, and lives there. Rather than hanging out in the hotel where all the journalists converge and reinforce their prejudices, he rents an apartment and goes talking to ordinary people. He listens to them, and respects their narratives even when not agreeing. Then he listens to other people, well informed by what he has already heard. It's depressing how unusual this is. Yet the book isn't like the blog. The book looks back and sums up. Blogs respond with immediacy to ongoing events; their authors can hope to report on events through a prism of informed context, but they don't know what will happen the day after they respond. A book can take a series of events and fashion a story out of them with a beginning, a middle, and an end, or at least an arbitrary end which can be justified in the context of the specific story being told. When the story is about recent events there's always the chance that future events will upend it. The story of Israel's peace with Egypt, signed in 1979, may prove to be dramatically upended if in 2012 or 2015 Egypt undergoes anything remotely similar to Lebanon; in that case it will turn out that four decades were not long enough to have a stable perspective. In addition, Michael - obviously - had no access to the documents created by the actors, nor to any reports by others who have had such access. No one has yet seen the correspondence between Hizballah and Iranian leaders or officers; between Maronite politicians and Syrian officials; or the deliberations of Israeli officials managing the war with Hisballah in 2006. Michael has written a first draft of history, not a definitive summary or interpretation. It's a valuable first draft, however. Given the cautious euphoria surrounding the Arab Spring of 2011, it's sadly a very necessary and timely first draft, because the Arab Spring could be impacted by some of the same phenomena. Lebanon is, after all, part of the Arab world. In March 2005 it looked like democracy was coming to Lebanon. In a dizzying sequence of events, Rafik Hariri was assassinated to prevent his re-election to prime minister, Hisballah sent half a million demonstrators to support the Syrian occupation of the country, a new coalition of all the other Lebanese responded with a demonstration more than twice as big, and international pressure forced the Syrians out of the country. It looked as if decades of strife were over, and Lebanon was poised to become a liberal democracy with a vibrant economy. What could be better? Just then Michael flew in and set up camp in Beirut, to report on the wonderful transition. A transition which never happened. The short explanation being that Iran and Hisballah didn't want it to happen, and had the power to thwart it. The longer explanation being that the forces against liberal democracy were far stronger than the ones in favor, and included, as Michael demonstrates repeatedly, many of the very people and groups who demonstrated in favor of it on March 14th 2005. This was the main insight I gleaned from Michael's book: that the hard men and their cold calculations purposefully aborted the naive, idealistic but unrealistic aspirations of the nice folks we were all cheering. It wasn't only the hard men of Hisballah or their overlords in Teheran. Actually, in some of the best sections of the book Michael wanders around in Hisballah territory and talks to regular folks, who turn out to be, well, regular. At one point he joins a pack of teenagers in a Hisballah camp in central Beirut, and learns that their jumbled understanding of the world includes, alongside other emotions, some rather positive feelings towards the United States. Yet this is ultimately immaterial to the developing events. Hisballah runs its areas with harsh police-state measures, brooks no opposition, allows no independent thought, and achieves whatever goals it sets for itself -and they aren't liberal or democratic. Hisballah has allies, other hard men with cold calculations. In a chilling section Michael has coffee with a couple of Maronite supporters of Michel Auon, a Hisballah ally, and they calmly explain their position. Then he interviews powerful leaders of what had once been the March 14th camp, and they explain why they've jettisoned their aspirations for liberal democracy in the face of Hisballah reactionary moves, preferring a lack of bloodshed over a lack of freedom. By the end of the book it's clear there's no-one who will stand up for liberal democracy, and given the implacability of its enemies and the proven horror of civil war, who's to blame them? The thing is, hard men who fear liberal democracy, detest America and hate Jews and Israel, are thick on the ground in the Middle East. An exuberant moment of popular expression of freedom is all very well and nice, but unless they've got their own hard men and are willing to confront their adversaries with cold determination, including a willingness to fight for the society they aspire to, it's hard to see how they'll get what they wish. In a deeply ironic twist, that seems to be the role of Israel in Michael's book. A thriving country and liberal democracy, surrounded by many thugs, and imbued with the cold calculating hardness necessary to protect itself. I'm not certain that's what Michael intended to be saying, but it's what I read: the only way to live the aspirations for freedom and democracy is by being hard enough to achieve them and then maintain them. The Lebanese forces who had the right aspirations lacked the determination; the forces with a different set of aspirations never lacked the determination, so they won, and will continue to win until forced down. They won't go away of their own accord, and they won't go away because of exuberant demonstrations in public squares cheered on by the rest of the world's media. They won't. As I said, however, that's my reading of Michael's book, and he may not have intended that to be its thesis at all. So I encourage you to read it and decide for yourself. In light of my previous post poking fun at the State Department, and my dissatisfaction with J Street, it's only fair to note that both august organizations think Richard Goldstone's recent retraction of parts of his own UN report are to be welcomed. Or in other words, they're not buying into the arguments being offered by the anti-Israeli blogosphere such as Mondoweiss or Andrew Sullivan, about how Goldstone's retraction doesn't mean anything and he got it all wrong. In the case of the State Department, this isn't surprising, since the American position was always that the Goldstone Report was hopelessly biased. J Street, however, had a bit of a problem at the time, when it did or didn't assist in arranging meetings for Goldstone with members of Congress. So it's nice that this time Jeremy Ben Ami seems to be clearly on the correct side of the discussion. Well, that certainly didn't take long. Two days ago, drawing on my awesome prophetic powers, I deemed that the American Administration would be irked by Jews discussing the possibility of building apartments in Jerusalem. Sure enough, while this time it wasn't The Man himself, the State Department has expressed "its deep concern yada yada yada". The plans set to be signed will in fact perpetuate the status quo in these settlements, disallowing any new legal construction, making the planned signing more of a symbolic achievement. In other words, the State Department is condemning an Israeli bureaucratic tweak which may not be about to happen but if it is will result in no additional building on some settlements. Get that? All clear? Me neither. Reform Rabbi Ammiel Hirsch, co author of One People, Two Worlds: A Reform Rabbi and an Orthodox Rabbi Explore the Issues That Divide Them , recently told Peter Beinart why he's wrong on all the important accounts which have created Beinart's recent (in)famy. Hirsch is Reform, lives and works in New York, and so far as I can see is as representative of a segment of American Jewry as anyone else - except for the fact that he served in the IDF. The transcript of his talk needs to be read in its entirety, which can be found over here (h/t Marek). Sadly, we aren't told how Beinart responded. I expect Ammiel's words effected him like water off the back of a duck, with the added value that being a duck is proving very lucrative for Beinart. Danny Seidman's Twitter account informs me that the Jerusalem municipality is expected to authorize the construction of more than 900 apartments in Gilo tomorrow. This can be expected to be portrayed as a Very Bad Thing, a new blow to the defunct peace process and so on. If past experience is a reliable guide Hillary Clinton will bemoan the decision, and her boss will ponitifacte that it's not helpful. Danny himself is against such construction projects, and has helpfully posted a map showing where it is. Now compare his map, if you will, with the map of the same area as portrayed by the Geneva Initiative, in their series which suggests how to divide Jerusalem. Will it surprise anyone to learn that the construction project is within the area Israel is expected to retain in any case? I.e an area the Palestinians already ceded, according to the Palestine Papers? So what's the fuss about? As for the project itself: it will create apartments for something like 5,000 people. Not enough to lower the rapidly rising prices of apartments in Jerusalem, but better than nothing. Ah, and if similar projects in other parts of town are anything to go by, some of the apartments will be bought by Palestinians from East Jerusalem. CAMERA has prepared a 15-minute film about a longer BBC film which told about Jerusalem as it isn't, and then refused to correct itself. The really ironic part about the false BBC report is that while it attempts to show Palestinian suffering under rapacious Israeli rulers, the reality is that growing numbers of Palestinians in East Jerusalem are acquiring Israeli citizenship as insurance against the day when Israel might leave and they'll be stranded in Palestine. Don't expect the BBC to report on this, however. It wouldn't fit the meta-narrative. 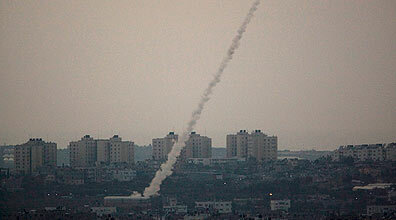 Update: The BBC won't tell the story, but Ynet (English) coincidentally has it today. Richard Goldstone now admits that the worst parts about the report that bears his name weren't true. Above all, the absolutely infuriating accusation which stood at the center of the report, that Israel purposefully and intentionally harmed civilians. Well, actually, no, he says. Too late. The damage has been done, and no retraction now will alleviate it, not unless, perhaps, the judge spends the rest of his days trudging from TV station to TV station, from newspaper to newspaper, from campus to campus, and insists that the original reports was an abomination. I doubt he intends to do that. On the contrary, his retraction is still calibrated to harm Israel: the reason he got it wrong, he now tells us, is that Israel reused to cooperate with him; had they been honest and open he'd have written a different account. Since Israel wasn't, however, he had no choice but to write a report which even he now admits was wrong. This is of course all wrong. There were as many flaws with the report as flies on a dung heap on a hot day (I chose this metaphor advisedly), and they were all obvious at the time. Indeed, memory of the Goldstone Report should be preserved, but not for the reasons that the editors intend. The report should serve as a potent reminder that, like other actors, international human rights lawyers and international bodies have passions and interests, biases and blind spots; they are capable of manipulating the facts and distorting the law; they often lack the expertise in military affairs that is necessary to responsibly apply international humanitarian law to the complex circumstances of asymmetric warfare; and their judgment is unconstrained by the discipline of democratic accountability and national security responsibility. The international law governing armed conflict — in Article 2 of the un Charter, Article 146 of the Fourth Geneva Convention, Article 17 of the Rome Statute creating the International Criminal Court — assigns to states with functioning judicial systems, which in particular means liberal democracies, the right and primary responsibility to investigate allegations of war crimes. The many and varied failings of the Goldstone Report illuminate the wisdom of this critical feature of international law. One final comment, which I'm not seeing in the discussion this weekend, is that Goldstone now seems to accept that the IDF's casualty figures of combatants versus civilians were right. Does the judge now have to give back the various prizes he got for his attacks against Israel? J-Street suffered a humiliating defeat yesterday on Capitol Hill -- which means Israel scored an important victory. The George Soros-funded "pro-Israel" group inexplicably mobilized its machinery to oppose a bipartisan letter that merely called on President Obama to pressure the Palestinian Authority to end its longstanding practice of inciting its people to commit terrorism against the Jewish state. Even in a town where tin-eared stupidity is commonplace, essentially protecting the PA's ability to encourage violence against its Jewish neighbors is jaw-dropping. Read the whole thing and you'll see it gets even weirder. Since I know there are a few J Street supporters among the readers of this blog, I encourage them to speak up if they've got a different version of the story. The background to this story is the St Mary of the Resurrection Abbey, where there stands a church built between 1141-1170, when the Crusaders ruled the area. Unlikely as it may sound, the church was never destroyed, and although it probably served as a warehouse or barn for many centuries, it was cleaned out in the late 19th century, and in the 20th the original paintings on its walls were uncovered and restored, as much as possible after 800 years. There aren't many cities in the world with fully standing 12th century churches in them, but the Muslim village of Abu Ghosh, West of Jerusalem, has one. When entering a church in Israel there's always the question of uncovering ones head. You're supposed to do that in churches, but religious Jews aren't supposed to do so at all. I always take off my hat, but sometime I don't take off my Kippa. This time there was a novelty, since our group included a young Muslim woman with her head covered, which she didn't remove, so the church accepted not only the sovereignty of the Jews, so to speak, but also the traditions of the neighbors. Father Olivier heads the Abbey. He's French, but speaks fine Hebrew. Astonishingly fine, actually, since many of his sentences contain up-to-date IDF slang. So eventually we asked him about it, and he grinned. Back in the early 1980s he was discovered by some women serving in the IDF education corps, and ever since then they've been using him as their in-house expert for Church matters (Ani mashak hinuch be-inyanei Notzrim). Whenever there's an IDF unit spending a week learning about Jerusalem, they call in Father Olivier to explain all the different kinds of Christians there are in town. Jerusalem never ceases to surprise.